'Spectabilis' means outstanding. What is outstanding about this Miltonia? The undulating margin of the lavender lip reminds me of Ginger Rogers long flowing evening gown. The lip is beautifully set off against the dusky plum backdrop of the orchid's petals and sepals. Very satiny. Very sophisticated. Admittedly, the plant has an idiosyncratic growth habit. The internodes (i.e., the length of stem between the pseudobulbs) are very long, giving the plant a sprawling habit best accommodated by a wide shallow basket. And the leaves and stems are an almost alarmingly vivid shade of yellow-green, a color normally associated with poor culture. Not to worry. This is the normal leaf color for Miltonia spectabilis. But it is in mid-late summer, when many other orchids take a hiatus from flowering, that my admiration for this Brazilian species deepens into a warm affection. Last week I set a pod on one of our plants in the Fuqua Orchid Center. A dozen more, please! 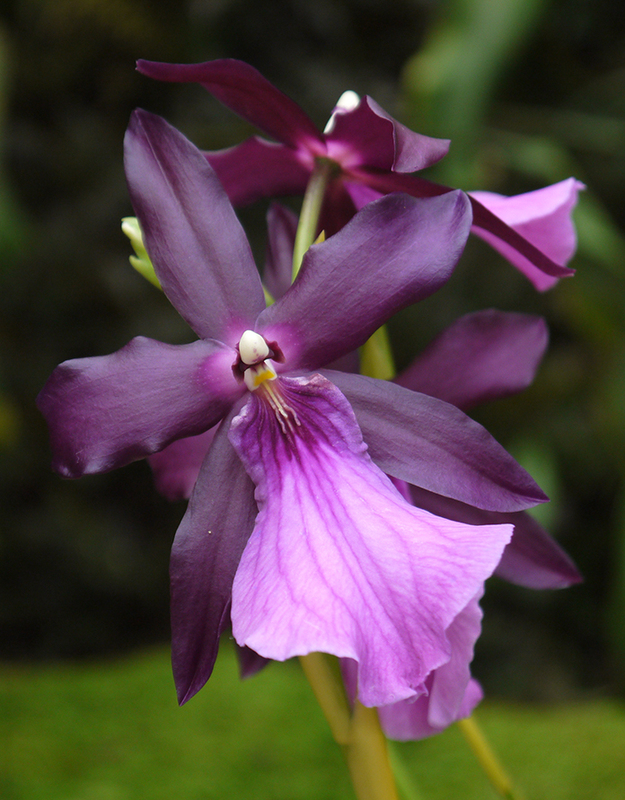 Miltonia spectabilis inhabits both cool mountain and warm lowland areas, growing epiphytically in the eastern states of Brazil from Pernambuco to Sao Paulo. It has white petals and sepals suffused with pink. The lip is rosy pink with deep pink veins. There are many varieties, of which the above photographed moreliana is just one. See Jay Pfahl's terrific website for more Miltonia info. Plants grown in containers want an epiphytic potting mix--we like a sphagnum-based mix. But they're not too fussy about their potting medium. Last year in a rush, with nothing suitable on hand, I potted some of ours in cedar baskets with just coconut fiber--definitely not on my list of preferred potting components. They're doing fine (though I'm keeping a close eye on them).